I'm looking for a nice quality paring knife. A good knife that's decent quality at a decent price. I was visiting my mother and asked her "Which knife are you using, the most often?". Her answer was "The paring knife". She takes good care of knives but a $300 knife won't impress her. I'm thinking 3"-4" and under $100. My bride is very fond of a $10 Victorinox parer, in spite of the cheap price. Amazon sells 'em. For general knock around in the drawer knife take the foil off a wine bottle etc. I have a couple of the $10 Victorinox Parers that I use a lot. Victorinox paring knife very hard to beat. Only knife I have that I wash in the dishwasher. Have to agree with the Victorinox paring knives. Wife gave me 4 a couple years ago and they do get used. Those Victorinox knives are good and super cheap. Mercer makes some nice forged knives at lower prices than the German knife makers. 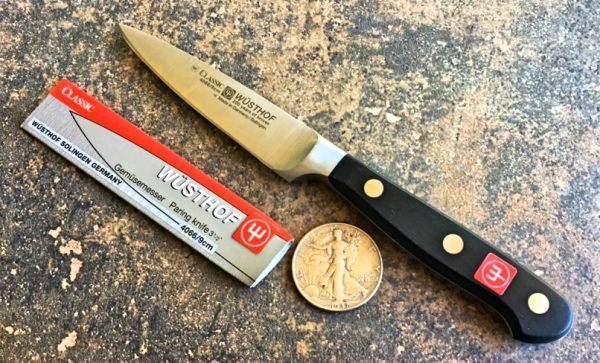 Wusthof makes a good knife, but I'm not sure it is 3 times the knife the Mercer is. I love the look, feel, and performance of the Wusthof Ikon series. When they first came out I purchased a set. Of the 10 or so knives that I bought (8" chef, 7" santoku, 3.5" paring, 6" utility, 4 steak knives, serrated bread knife, carving knife), 7 of them eventually had problems with cracks in the resin handles. Of course, they have a lifetime warranty for manufacturer defects, and the ones with issues were all replaced free, minus shipping. Always hand washed; I don't even own a dishwasher. I still love them and would buy again. It's just something to be aware of. Funny enough, the Victorinox is the one she has beaten to death. I ordered her the Mercer to try. We'll see what she thinks. Over the years I have bought 4 or 5 Opinel paring knives. They are inexpensive without screaming out cheap like I th8nk the Victorinox paring knives look. I get the stainless (inox) kind. Take a good edge. Very nice for the price. We've used one like this for the last 20 years, it's awesome. Most used knife in my kitchen. I also have the Victorinox. I bought a set for my wife to use (she's rough on knives) and for the money they are fantastic. They can't hang with the Wusthof though. Victorinox and Henkels are my go to parers. Thanks. I ordered one of these Mercers. Looks like it may be a dandy. I just got my Mercer today. It IS a Dandy. It's pretty much a Wustof with a Delrin handle. Nicely made, took a great edge and feels excellent in hand. I'll be be doing food prep with it tonight. Looks to be an outstanding deal. Thanks again jhe888 for the original recommendation. The Mercer is really nice! My only slight disappointment is that I thought it was made in America from German steel. Almost. It's made in Taiwan from German steel. Better than China. My favorite as well. I have three of them. You will not find a better paring knife IMHO. Actually, a fairly good brand of 'paring-knife' comes from of all places, Brazil. The brand name is Tramontina. Most places that carry kitchenware stock them. Inexpensive, and fairly decent quality.